As time comes to pass, Kobe’s Chinatown is quickly becoming one of my favorite neighborhoods in the city for several reasons. One reason, in particular, makes me keep coming back to the quaint part of town, though: liveliness. At the heart of Kobe’s Chinatown is a pagoda with some benches, a small open space, followed by more benches, and a nice fountain. 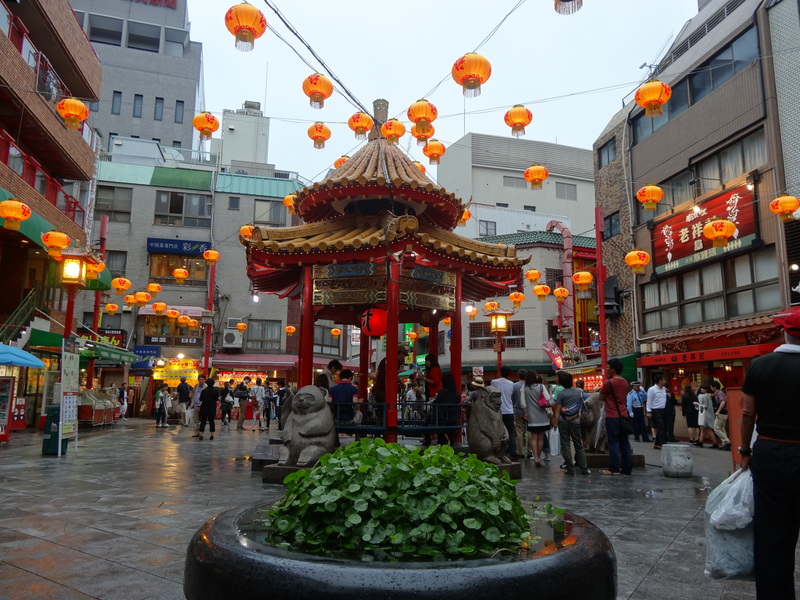 Imagine this area to be surrounded with lanterns hanging above as you take in the sights, sounds, and smells of Chinatown in Japan. I love to people watch, so I headed down to Chinatown on Saturday for an afternoon of relaxation, language practice, and people watching. What ended up happening was very different than what I expected to encounter. I ran into a friend of mine in Sannomiya during the walk to Chinatown and we decided to enjoy some Cuban cigars in Chinatown as we relaxed for the afternoon. I have not had a cigar since I arrived in Japan, so this was such a great idea. Following our trip to the tobacco store, we embarked for Chinatown to do some people watching and to pass some time. Suddenly, a light rain began to fall and the mood of Chinatown changed dramatically. The edge of noise began to fall as some people left the streets while others lingered. As dusk began to settle in, Chinatown took on a different personality as it was dominated by small families bustling about, eating noodles and chatting about the weekend’s activities. For such a small part of the city, this energy should not be there, but it certainly was. Breathing in the smells of street food and watching the kids frolic about was magical for me, and I still do not know why. My friend and I sat back, enjoying our cigars, taking in the whole scene. I found it glorious. A passing rain shower and a random encounter with a friend really made the afternoon so much more enjoyable than I had expected just a few hours earlier. I hope this photo can do something to convey how Chinatown felt on that late afternoon. When the shower stopped, my friend and I carried on to the JR station to go to our next destination. However fleeting, we were able to escape from everything, even if only for a few hours, on Sunday. This is another reason why I enjoy Japan so much.